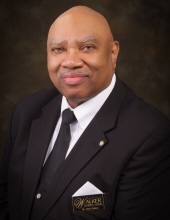 Herbert Walker, Jr. was President and Co-Founder of Walker Funeral Home. He was a lifelong resident of Cincinnati, born in Cincinnati’s historic West End, with strong ties to the community. Throughout his life he worked tirelessly to make improvements wherever he could. Herbert distinguished himself with his diligence, working as a mail handler at the United States Postal Service’s downtown and Sharonville locations. After Herbert retired from the U.S. Postal Service, he brought his work ethic and advocacy abilities to the Hamilton County Community Action Agency (HCCAA), where he managed the Home Energy Assistance Program, a federally funded program that helps low-income and senior Ohio citizens pay their home energy bill. As the patriarch of the Walker family, he encouraged his children to commit themselves to a life of service. He buttressed his son's dream of starting the Walker Funeral Home to help families through the difficult time of losing a loved one. He enjoyed working alongside his son at the funeral home, serving bereaved families. His primary goal was to ensure that everyone experiencing loss, regardless of income, will be treated with dignity and respect. That is the Legacy of Walker Funeral Home. Known for Excellence. Trusted for Value.